Ok campers. What is this? 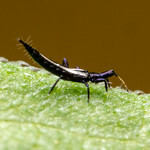 Eight Myrmecos points will go to the first person to correctly pick the genus of insect pictured here. Two additional points will go to the first person who can name the underlying structure that supports these lovely speckles. 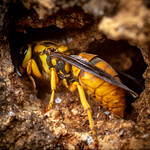 The cumulative points winner for the month of May will win their choice of 1) any 8×10-sized print from my photo galleries, or 2) a guest post here on Myrmecos. Gonna guess the colors are the structural, replying on melanin deposits in the epicuticle and exocuticle, which reflect certain wavelengths depending on the thickness and organization. I almost never get to these before the heavyweights have devoured all the points. I probably am wrong about the melanin. The first reference I could find regarding cuticle microstructure was Knisley and Schultz 1997, and I think may have misinterpreted the caption on the SEM figure, which was referring specifically to the darker maculations on a tiger beetle. My first time getting here quick enough to guess! Solid knowledge and lightning reflexes – yes, Coulter is the Challenge Master! Good to know html code works on WordPress. I wasn’t sure. Huzzah! Yes, Yes, but you did not [u]underline it as well as [i]italicize Elaphrus[/u][/i]! Therefore no points could logically be issued. No chance! It’s tough to time Alex’s posts just right. That’s why Alex invented the awesomely useful RSS feed widget !! 8:00pm Monday night, though I was a few minutes late tonight. Plus, I tweet the MNM when it goes live (I’m @Myrmecos). I am SO FAR out of my LEAGUE, I expect Firefox to boot me off this site as unworthy. WOW. I was going to say Cylindera, so good Ben got there first with a correct answer. Or is it? You folks are great! My very late guess is that this is a beetle at a discotheque.